Odds are you’ve heard of video compression in the past, and may even know that many of the videos you come across nowadays are compressed and optimized so that they consume less space. Without compression, video file sizes can be extremely large – which may very well be the case with some of the videos you encounter. With terabytes worth of storage nowadays, it may not seem that bad to have videos that consume several gigabytes at a time – however on mobile devices that have more limited storage it can still be a very big deal, and even on PCs it can start to pile up quickly. If you want to reduce video file size, you need a video converter that is capable of compressing them – and the Movavi Video Converter will let you do just that quickly and easily. Using the Movavi Video Converter to convert videos is really very straightforward: Load the video, choose a format, and click ‘Convert’ to get started. With that alone you can take care of many of your problems, and you can even optimize your video with the best possible settings for a certain device or platform by choosing one of the hundreds of presets that are available. Assuming you want to really compress your video however, all you need to do is click the ‘Settings’ button and you’ll be able to adjust the resolution, aspect ratio, frame rate, and bit rate – all of which affect its file size. Also you can switch the codec to something more up to date like H.264. Aside from that, the Movavi Video Converter will also let you directly decide what file size you want your video to be by clicking on the estimated size value in the ‘Output’ column. When you do that, you’ll find a slider that you can conveniently adjust to the file size that you want. Apart from making it so easy to compress your videos, the Movavi Video Converter also comes with tons of other features that will allow you to cut and combine video segments, enhance the video quality, insert customizable text, extract audio from video, create animated GIFs, grab screenshots from your videos, and even crop or rotate them. By using these features, you can tweak and adjust your videos as and how you see fit. 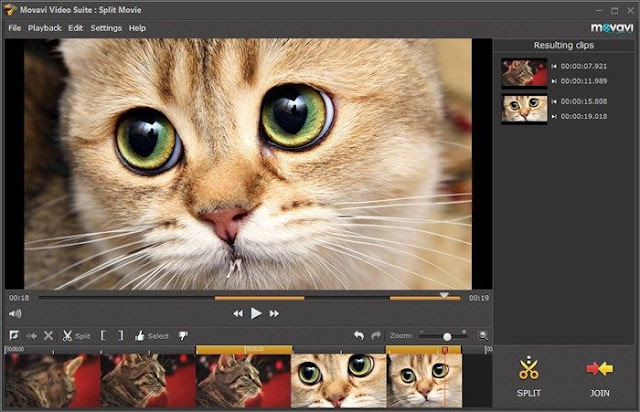 In some cases you may even find that cutting out the important segments of a video and saving them as a separate video clip is preferable to compressing the entire video. The choice is entirely yours – but the Movavi Video Converter will certainly provide you with all the tools you need to be flexible about how you compress your videos and reduce their file size.